with its private white beach surrounded by pristine waters. this five star island resort in the heart of the Indian Ocean is a unique experience in life. It harmoniously combines the display and restoration of the intense history of the islet with its adaptation to modern necessities and facilities. The Hotel has 15 exclusive deluxe cottages which are located in the north-west side of the island, discretely distributed along the sea-line, affording maximum privacy and seclusion. The cottages are built using local materials and topped with traditional thatched roofs, achieving cool atmosphere day and night. The spacious interiors are elegantly decorated and equipped with mosquito nets and ensuite bathrooms, all with 2 al fresco showers and bathtub. 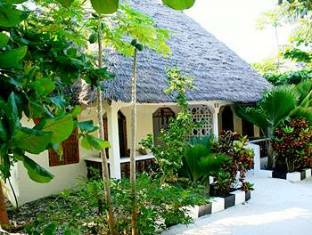 The hotel's chef prepares a delicious variety of cuisine incorporating traditional Zanzibari elements as well as the freshest fish and sea food, a choice of settings and flavours to entice the most demanding palate. One can enjoy a delicious pizza al fresco overlooking the magnificently restored Prison Ruins. The Zanzibar Archipelago is as mystic, beautiful and serene today as it has been for centuries. Zanzibar, a happy mix of Africa and Arabia; Noel Coward sang about it in the 1930s, Dr. Livingstone used it as an expedition base and it was the birth place of Freddy Mercury. The turquoise waters and white sands with the sun glinting off tin roofed residences.